While speaking to the Turkish liaison official charged with the Talks Mr. Oglan Baker, the Head of State gave his sentiments in the background that 'since past SL-Somalia Talks bore no fruits'. He said that for the talks to bear fruits it was imperative that the IC be incorporated. According to a press release from the Presidency yesterday afternoon, the President's talks with Mr. Baker further highlighted the fact that the Head of State sought from Turkey non-partisan treatment as concerns grants to Somaliland and Somalia. 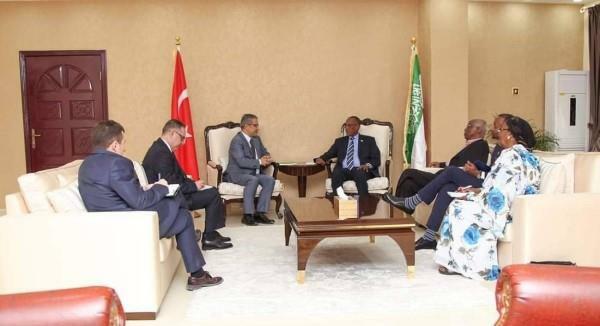 He said, 'The Turkish government should show the people of the country non-partisan attitude as concerns Somalia hence development grants and alms extended to the two countries should be of equal proportions and not as the status quo'. Indeed most of the grants now given to Turkey have its lion's share going to Somalia.